Electronic scoreboards for Australian football have come a long way since the first sepia version was installed at VFL Park when it opened. 2019 will see the performance standard raised yet again when Ci’s first example gets installed at the Whitten Oval. Internet enabled, it can display a news feed across the bottom as well as the Bulldogs winning score at the top. Thanks to the quality of the LED to be deployed for Whitten Oval, any sports action content displayed will look great. Source indigenous furniture inbuilt with your choice of technology. Winya, Australia's leading indigenous supplier of office furniture now includes a furniture range with inbuilt collaboration and presentation technologies. Via Ci you can get your choice of technologies expertly put together and inbuilt and this makes the tech fit out of any workplace ultra easy to install. The science must work. CSIRO wouldn’t be doing it otherwise. This means very soon we’ll be able to show you our first fully-fledged example of Plantronic’s Habitat Soundscaping technology, known to increase productivity in an open plan office by 15%. Watch the video for an explanation. Santa knows where he's going when he gets to Melbourne thanks to this animated signage from France. Able to be programmed with a vast number of destinations, it can point pedestrians in the right direction as well as give them a travelling time and distance. It can also show the mode of transport. 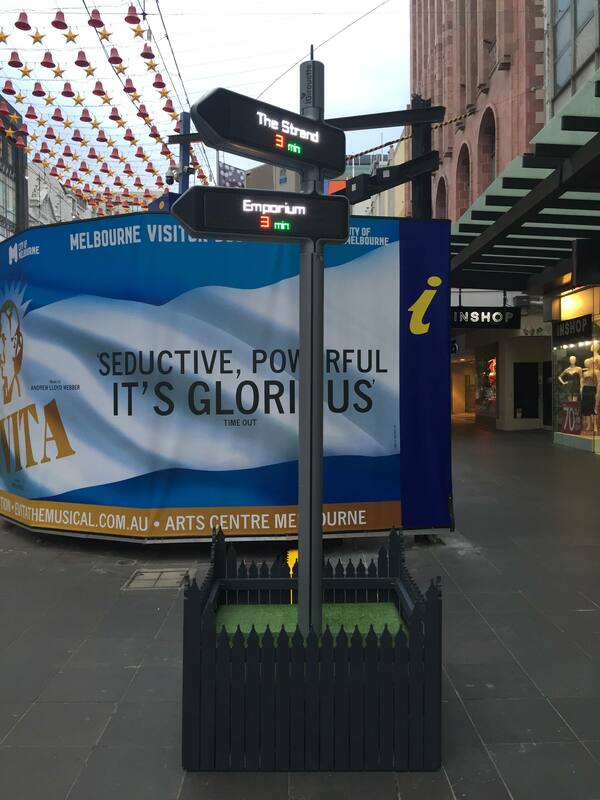 The City of Melbourne is having a bit of fun with it as part of their Christmas promotion. It literally turns heads.